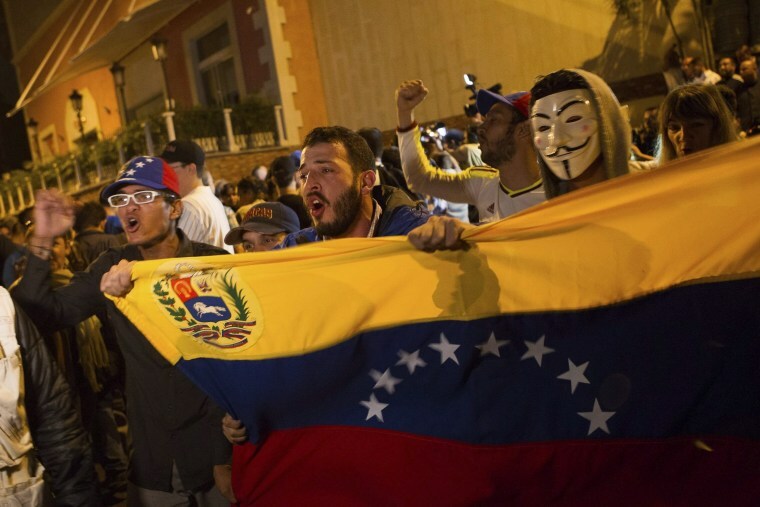 CARACAS, Venezuela — Venezuela's opposition won control of the National Assembly by a landslide, trouncing the ruling party and altering the balance of power after almost 17 years of socialist rule. The opposition coalition won at least 99 seats in the incoming 167-seat legislature, electoral authorities announced after midnight Sunday. The ruling socialist party won 46 seats. The 19 remaining races remained up for grabs but if enough are won by the opposition it could give the coalition a two-thirds supermajority needed to strongly challenge President Nicolas Maduro's grip on power. The streets of the Venezuelan capital of Caracas broke out in shouts of joy, fireworks and car honks after National Electoral Council President Tibisay Lucena announced the partial results six hours after polls closed. In the plaza in wealthy eastern Caracas that was the epicenter of last year's bloody anti-government protests, a small group of opponents, some of them sipping champagne, burned red shirts that are the obligatory revolutionary attire. The defeat was worst for the ruling "Chavismo" movement since its founder Hugo Chavez took power in 1999. Maduro, 53, had repeatedly vowed in recent weeks to take to the streets if his party lost. But on Sunday night he softened his tone, urging his supporters to regroup from the loss in calm. "I call on all of our people to recognize in peace these results and re-evaluate many political aspects of the revolution," he said. Opposition leaders meanwhile spoke in strident terms, a prelude to what's likely to be a period of intense political fighting in a deeply polarized country mired in an economic crisis. Voter turnout was a stunning 74 percent, the highest for a parliamentary vote since compulsory voting ended in the 1990s, as Venezuelans punished Maduro's government for widespread shortages, a plunging currency and triple-digit inflation that has brought the economy to its knees. "Venezuelan families are tired of living the consequences of the failure," Jesus Torrealba, head of the Democratic Unity opposition coalition, told supporters at campaign headquarters. "The country wants change and that change is beginning today." The opposition victory deals a serious setback to the socialist revolution started almost 17 years ago by the late Chavez, who until his death in 2013 had an almost-magical hold on the political aspirations of Venezuela's long-excluded masses. Underlining the depth of feeling, videos circulating online seemed to show five prominent socialist politicians — including Chavez's brother Adan — being booed at voting centers on Sunday, with crowds yelling "the government will fall!" or "thief!" Glum government supporters followed Maduro's lead in accepting the results. "That's democracy," said Gloria Torres, 54, an administrator who organized prayer vigils for Chavez when he was dying. "We're Chavistas and the fight continues."